A Trip to the Emergency Room | To Be, To Be. Tutubi. I had a scary Monday afternoon yesterday. On my way back to the office from the Pag-Ibig branch in Cubao with my sister, I received a text from my husband for me to proceed to the emergency room of The Medical City. He was there because his blood pressure shoot up to 190/110! It was 1pm and I haven't had lunch, combined with the heat outside, by the time I reached him at the ER, my hands were shaking. He was like this when I get there. He was attached to an ECG machine and he was already given Catapres. A blood pressure monitor was also attached to his other arm. To say I was scared was an understatement. I was terrified! My husband works inside the hospital so when he felt really dizzy, he brought himself to the ER. It was not like him to call me and make me worry so I knew when he texted that he was really feeling bad. The diagnosis was poorly managed hypertension. He was told to refrain from taking salty/fatty foods and alcoholic beverages. Here he is feeling better already. After 3 hours and with his dizziness almost gone, we were thankfully allowed to go home. Now, I vowed to watch his diet more carefully and to remind him to exercise more religiously. I know that I am also at fault since I am the one who prepares the food, but on the exercise front, he is the only one to blame. He just won't budge some mornings for our jogging exercise! And I have a sneaky suspicion that he had a drink last Saturday when he saw I was already asleep. Anyway, we were both rightfully frightened by this experience and I really pray that this won't happen again. Tsk, tsk hypertension at his age! 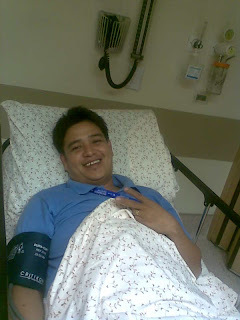 hi my husband has high blood pressure too, he is 34 now n must take 125mg medicine everyday. A day left, he will have very bad headache. One time last month, when I had my monthly check up the Doctor was already alarm at my blood pressure reading of 140/90.I had to reduce my intake of red meat and do my exercise regularly. Now my blood pressure is normal. Thank God. I Want A Car Now! I am a Proud Mommy!